Rajendra Patil was born in 1966 in Chopda, Maharashtra. In 1989 he completed his B. A. degree in History from Ruia College, Mumbai. In 1990 he received his Government Diploma in Art (Drawing And Painting) from L. S. Raheja School of Art, Mumbai. In 1991 he received his Post Diploma In Art Education from Sir J. J. School of Art, Mumbai. In 1996 he received his Art Master Degree from Sir J. J. School of Art, Mumbai. Since 1992 Rajendra has been a lecturer at Sir J. J. School of Art, Mumbai. In 1995, 1998, 2001, 2005, 2008 and 2013 he exhibited solo at Jehangir Art Gallery, Mumbai. In 1998 he showcased solo at Oberoi Art Walk Gallery, Mumbai. In 1991, 1992, 1993 and 2002 he participated in group shows at Jehangir Art Gallery, Mumbai. In 1991 and 1992 he took part in group exhibitions at Artists’ Centre, Mumbai. In 1995 he participated in a group show at Son-et-lumire. In 2002 he took part in Mumbai Musings at Habitat Art Center, New Delhi. In 2007 he participated in World Art Expo in New York. In 2008 he took part in the Second International Exhibition of Visual Arts in Brazil and the UNESCO. In 2009 he took part in the lyrical abstract group show in Delhi. In 2009 he took part in the National Artist Camp at Manor. In 2012 he participated in the National Artist Painting Camp at Lalit Kala Academy, Chennai. In 2015 he participated in a group show at Jehangir Art Show, Mumbai. In 2017 he participated in ‘Confluence’, a group show at NGMA, Mumbai. In 2017 he took part in the Bharat Bhavan Biennale at Bhopal. In 1988 he won an award from the Mumbai University. In 1990 he won the Best Academic Work Award from L. S. Raheja School of Art, Mumbai. In 1990 he won the Usha Deshmukh Gold Medal in Maharashtra. In 1990 he won an award from the Art Society of India, Mumbai. In 1991 he won an award from Nasik Kala Niketan and won an award from the Bhausaheb Deshmukh Academy, Amrawati. In 1995 & 1998 he won awards at the V. V. Oak Art Competition in Pune. In 2000 he won an award at NGMA, Mumbai. 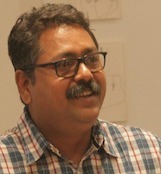 In 2001 he won the Maharashtra State Art Award. In 2001 & 2004 he won Prize & Medal for Best Entry at the Bombay Art Society.